Stem: 1--1.5 m; nodes short, soft-hairy. Leaf: sheath glabrous to minutely scabrous; ligule +- 1 mm, truncate; blade 10--28 cm, 8--14 mm wide, margin strongly scabrous, with downward-pointing teeth. Inflorescence: 12--20 cm; lower branches +- spreading. Spikelet: 4--5 mm, oblong to narrowly elliptic; lemma 4--5 mm, width 3--5 × palea width. Chromosomes: 2n=48. Ecology: Marshes, streams, ponds; Elevation: < 1200 m. Bioregional Distribution: CA-FP (exc CW); Distribution Outside California: to British Columbia, eastern North America; Eurasia. Flowering Time: Aug--Oct Note: Lateral inflorescences enclosed by sheath, generally cleistogamous. Leersia hexandra Sw., with ascending to appressed inflorescence branches, smaller spikelets, has been reported, but not documented, in rice fields in ScV. 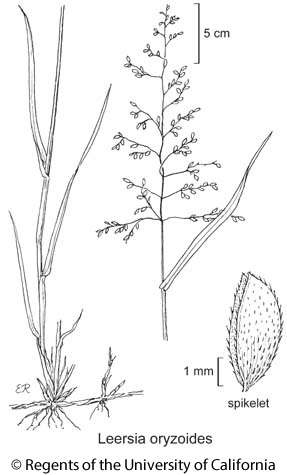 Citation for this treatment: Dieter H. Wilken 2012, Leersia oryzoides, in Jepson Flora Project (eds.) Jepson eFlora, http://ucjeps.berkeley.edu/eflora/eflora_display.php?tid=30431, accessed on April 23, 2019. CA-FP (exc CW); Markers link to CCH specimen records. Yellow markers indicate records that may provide evidence for eFlora range revision or may have georeferencing or identification issues. Purple markers indicate specimens collected from a garden, greenhouse, or other non-wild location.